These healthy habits are good for all ages and the sooner you teach your children, the easier it will be for them to develop the habits they need to reap the sweet benefits of a long and healthy life. Expert tips for getting a good night's sleep from Hudson Valley Favorite Doc. 2. Get outside & play. Studies show that people who spend time in nature have fewer anxiety disorders, digestive diseases and a healthier mind, body & spirit. 8 Tips for the perfect hike with kids. 3. Don’t smoke, or quit now! Luckily, the overall cigarette smoking rate in the U.S. is at an all-time low according to the American Heart Association. Still, more than 34 million Americans smoke. Talking to kids throughout their childhood about the risks is always a good idea. Don’t forget to set a good example too! Read why more American’s are kicking the habit. 4. Spend time with loved ones. A healthy heart isn’t referring only to the beating organ in your chest. Recognizing the signs and symptoms of depression, anxiety and stress is important to making good choices that will keep your heart healthy. Pick up the phone and call mom, take a walk with a friend or seek therapy if you have no loved ones nearby. How to stay heart healthy when you are down. 5. Eat lots of fruits & vegetables. Cook more meals at home, swap out processed food & ad more color to your plate with fruits & veggies for a healthier heart. Read all about eating smart for a happy heart. 6. Raise your heart rate. Everyone is living busy lives these days and finding time to squeeze in a full workout can be a struggle. There are easy ways to get your family moving and your heart rate up without needing to hit the gym. Take the dog for a walk, take a quick lap around the mall before you start your shopping and take the stairs to step up your heart rate. 7 Easy ways to move when you have no time for exercise. 7. Visit all your doctors. Regular health exams are important to find problems before they start. Get in the routine of regular health services, screenings and treatments so that you and your family will be on your way to living a long and healthy life. Just don’t forget about all of your doctors! Dentists, eye doctors, etc. are all just as important for regular visits. The Center for Disease Control and Prevention lists the importance of family check-ups. 8. Eat at home. Healthy eating starts at home. Involve the whole family in learning how to shop, prepare and cook healthy meals that everyone will enjoy. The internet is a wonderful resources for hundreds of healthy recipes you can try. The American Heart Association’s Healthy Cooking Skills. 9. Enjoy good mood foods. You were eating healthy and feeling good but you had a bad day and ate a box of cookies… uh oh! Pay attention to your food/mood relationship! Foods such as fruits and veggies, Omega-3 fats & chocolate have health benefits that are sure to boost your mood! Learn more about how food effects your mental health. 10. Be grateful! Practicing gratuity, according to researchers will have a lasting positive impact on overall health including lowered blood pressure & improved immune health. Learn more about how thankfulness can affect your health. 11. Surround yourself with healthy relationships! Studies show that social relationships, for better or worse effect mental and physical health and mortality rate. Surround yourself with positive, healthy relationships, your heart will thank you! Check out the science behind social relationships and health! 12. Live by example. You can’t just talk the talk, you have to walk the walk too! Setting a good example for exercising, eating and living well will set your kids up for a healthy life. 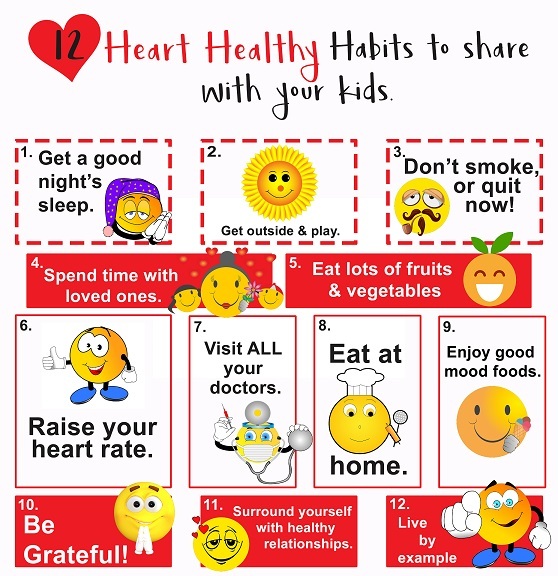 6 Simple Steps for the Whole Family to be Heart Healthy.